Fifty years later, the hostility has receded and Peeping Tom is now recognised as one of Powell’s best works. It has been the subject of numerous articles, which have focused mostly on voyeurism and/or Freudian analysis. The film itself encourages this, right from the choice of title. The particular perversion of the central character Mark Lewis is to film his victims as he kills them, and his films-within-the-film highlight the obsession with watching &#151 and of course, with cinema itself. Mark’s psychopathic behaviour is explained in Freudian terms, a result of the abuse he suffered as a child at the hands of his father. The film even introduces the character of a mildly ridiculous psychiatrist into the plot to give a helpful explanation of ‘scopophilia’. There is no doubt that voyeurism and psychoanalysis are major themes. Yet, it seems that there must be more to Peeping Tom to fully explain its extraordinary impact on audiences, which is undiminished by the years. One theme that has been relatively neglected in the discussions is fear, even though it is so clearly central to the film &#151 the abuse suffered by Mark is a result of his father’s experiments on fear. Is it not indeed because Peeping Tom is a relentless study of human terror that it is so disturbing? ‘Do you know what the most frightening thing in the world is?’ asks Mark. ‘It’s fear’. We, the audience, stand back in shock, forced to face the profound nature of our own fear. For what Mark is telling us is that there is no explaining fear away when the cause of fear is fear itself. The circular statement points to the disturbing irreducibility of absolute terror. Beyond all the rational explanations &#151 of which psychoanalysis is one &#151 there remains a pure, causeless fear. And what is truly fascinating about Powell’s masterpiece is that in its willingness to delve deep into this primal human fear Peeping Tom goes beyond the reductive Freudian framework and reconnects with one of the most archaic figures of terror in Western culture &#151 the mythical figure of Medusa. In the film’s equation of seeing with dying, in its complex mirror effects, echoes of the deadly Gorgon resonate throughout. In Peeping Tom, to film someone results in their death. The camera is like Medusa, its gaze deadly for whoever looks back. The parallel goes even further for Mark’s set-up is extremely complex. To his camera is attached not only a deadly blade but also a mirror. This is a rather strange contraption but think of the Medusa myth and it takes on a remarkable meaning. There are many variants to the story &#151 in one, Perseus uses his shield as a mirror; in another he looks at Medusa’s reflection in water. In all the versions though, there is one recurrent idea &#151 Medusa’s gaze has to be deflected. In Peeping Tom, the camera and the mirror are used exactly in that way, allowing Mark to look terror in the eyes without being turned to stone, like a modern Perseus. A highly transgressive figure, Mark goes one step further than the Greek hero, using his elaborate device not simply to confront the monstrous Gorgon but to record something that should normally remain beyond human experience. As he films his victims watching themselves die, Mark is able to catch the reflection of unspeakable terror in his camera. Just like in the myth, not returning Medusa’s gaze is crucial. The character who can best fight Mark’s monstrous camera-mirror-spike is Mrs Stephens, a blind woman living in Mark’s building with her daughter Helen, who has befriended Mark. While Mark aspires to see the forbidden sight of absolute terror, Mrs Stephens sees what cannot be seen about Mark. Hearing Mark move upstairs in his room she knows that his filming is ‘unhealthy’. When she appears in Mark’s room, and it is indeed an apparition, a ghostly shape that manages to startle the murderer himself, the roles are reversed. As Mark walks towards her to make her leave the room, she lifts her sharp stick towards him in a striking echo of the spike on Mark’s camera. But when Mark starts filming her he is once again the aggressor. However, as she can’t see her own fear in the mirror, filming her is useless, and she is able to defeat Mark’s murderous set-up. Made of elements that do not naturally belong together, Mark’s camera-mirror-spike is a monstrous composite being. The freak camera is Mark’s unnatural appendage and together they form a terrifying half-human, half-machine creature. The camera is an integral part of Mark, as is made clear when Helen calls it an ‘extra limb’. Mark’s camera, a 16mm Bell and Howell Filmo, is different from the other cameras that appear in the film. When Mark is moved by the new model Lorraine’s deformed lip in the photo studio, he takes out his own camera to film her even though he has been taking pictures with the 8×10 view camera until then. When Mark films the actress Viv in the film studio, he does so with his special camera rather than the 35mm Mitchell that is already on the set. (1) The deadly glare of the Gorgon does not come from just any camera but from the monstrous fusion of Mark with his personal camera. It is this idea that makes the film so utterly fascinating. Through the camera-Gorgon, the film explores the boundaries between the self and the other, the dead and the living, the savage and the civilised, the human and the inhuman. It is explored through the victims, but also more complexly through Mark. In his dying victims Mark sees himself doubly reflected as ‘absolutely other’: other as female and other as dead. The most frightening thing in the film is not death, it is the terror of looking at oneself and seeing something unrecognisable. This is what explains the striking expression of terror on the victims’ faces. The horror that comes from realising this loss of integrity is spectacularly expressed in one of the most memorable representations of the mythical figure, Caravaggio’s Head of the Medusa (circa 1596-98). The feeling of intense dread exuded by the painting becomes even more startling knowing that it may be one of the artist’s early self-portraits, painted using a mirror. In the painting, Medusa is therefore not a monster, but a human face, the reflection of the painter himself, his head cut off, engulfed in the horrors of the infernal snakes and the streams of blood spurting out of his neck. This has to be one of the most powerful depictions of the terror of being faced with one’s dismembered self, no longer human, transformed into a monstrous other. Caravaggio’s painting highlights another essential aspect of the myth that is directly relevant to Peeping Tom. What makes the painting so unforgettable is the expression of pure horror on Medusa’s face. This means that Caravaggio represents Medusa, a frightening monster, as a frightened being. The face of terror is a terrified face. This touches on a fundamental aspect of the myth. According to Jean-Pierre Vernant, there is a strong link between frightened and frightener in the Medusa myth. Among many other examples Vernant mentions how, as Herakles was possessed by infernal powers, his face turned into the Gorgon’s face. Experiencing the most intense fear, he in turn provoked terror in those around him. (4) We should remember that of the three Gorgons, Medusa is the mortal one. It is no accident that one of the most potent figures of fear in Greek mythology should be mortal. Is it not precisely because she is mortal that she can represent so effectively the fear of annihilation? So we are back to where we started: ‘Do you know what the most frightening thing in the world is?’ asks Mark. ‘It’s fear’. The reciprocity that is so central to the myth is at the heart of the film. Mark, scared by his father, scares his victims. Mark becomes frightening because he’s frightened. Terror is the emergence in oneself of the other, the ordered self disappearing to give way to a chaotic self that cannot be kept under control and in turn scares others. Nowhere is this reciprocity of fear clearer than in the scene where Mark shows Helen his father’s film of him as a child. Mark the killer watches Mark the scared child. When Helen screams, ‘Switch it off! Switch it off!’ Mark is incapable of moving, glued to the screen. Helen has to switch the projector off, breaking the spell. The most frightening character in the film is also the most frightened. This is brought home by one of the most shocking images of the film. At the end, as an anguished Helen presses Mark to reveal what he did to the women to scare them so much, Mark lifts the camera to her face. The next thing we see is the distorted image of Helen’s face in the mirror. While the killings are shown with much restraint, Helen’s deformed face is brutally and unexpectedly thrust at the viewer, her fear making this the most disturbing image of the film. The reciprocity and mirroring at the centre of the Medusa myth are amplified by the medium of film. The multiple films-within-the-film create a great deal of ambiguity, and it is sometimes difficult to differentiate between Powell’s film and Mark’s films. The blurring of the different films becomes explicit when a scene between Mark and Helen ends with the word ‘Cut’, the next scene taking place at the film studio. What does this ‘Cut’ refer to? Is it Powell filming the scene with Mark and Helen or is it the commercial director filming at the studio? 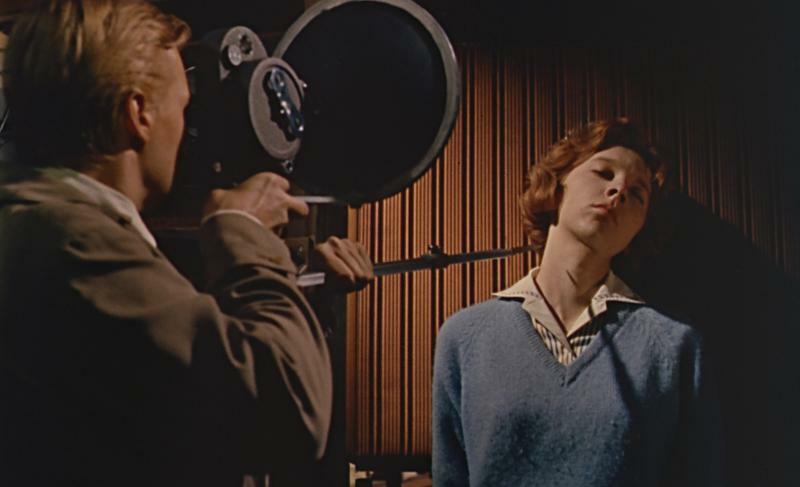 There are in total four directors in Peeping Tom &#151 Mark, the father, the commercial director and Powell &#151 and four types of film, so that what is an apparently singular reality &#151 the film, the director &#151 is here vertiginously divided. The various films being made are intertwined; images are borrowed and repeated, so that the result is complete ambiguity as to the directorial authority of what we are watching. To start with, the images are clearly differentiated through the framing devices and the opposition of colour and black and white but, gradually, they dissolve into one another. What starts as mirroring ends up as blurring and fusing into one another. There are no longer any certainties about where one film starts and where another ends. There are no longer any certainties about where the self starts and where the other ends. This is compounded by the fact that Michael Powell himself plays the role of Mark’s father while Powell’s own son plays Mark as a child. Powell thus faces himself: the director of Mark’s childhood films faces the director of Peeping Tom. This is very much a clue as to the ultimate meaning of this mirroring device. Powell’s camera is reflected as other in Mark’s camera. Powell is reflected as other when playing Mark’s father, turning his son into an other. Everything in the film, including Powell himself, faces Medusa, the unrecognisable other. Brilliantly, Powell comments on his own position as director of the film by reflecting himself in Mark’s father, a false figure of order attempting to impose an illusory rational explanation onto the deepest human fears at the expense of Mark’s mental health, causing ultimate, deadly disorder in Mark’s psyche. Is this what Powell thought he was doing to his audience? It might well be, for the mirroring effect of the film means that, in the darkness of the cinema, the spectator himself, like the characters he is watching, faces his self as unrecognisable other. The complex mirroring device installed by Powell exposes and simultaneously protects the audience. Powell’s camera, redoubling Mark’s camera, affords us extra protection against the direct glare of the Gorgon, removing her, placing her at a safe distance, and allowing us to look at her without being petrified. However, audiences should not feel too safe for the first thing that happens to them in Peeping Tom is to be watched. The film strikingly opens on the close-up image of an eye, shut, as if sleeping, while we hear a jarring, dissonant music. After a few seconds the eye suddenly opens, wide with fear, the startling effect underlined by an abrupt change in the music. This is a violent reversal of positions. The viewer is brutally put in the position of the viewed. In keeping with the reciprocity central to the Medusa myth, the frightened eye frightens the viewer. The aggressive use of spotlights is a further visual assault on the audience. When Mark switches a bright cinema spotlight directly onto Helen’s face in his back room or on Viv in the film studio, the light is effectively turned on us, the audience. The blinding spotlight figures the deadly power of vision, of Medusa and of Mark’s camera, the audience being in the position of the victim. Mark’s camera is another weapon of vision used against the audience. In the opening scene with the prostitute, Mark turns his camera on and starts walking towards the screen, moving menacingly towards us. The camera is the aggressor, attacking the audience in an unconventional shot. In that scene, we are the victims while the camera has its deadly gaze on us but we become the voyeurs as soon as Mark’s camera turns on the prostitute. It is as if the camera-monster walked towards us to fuse with us, forcing us to identify with it. What is disturbing is not simply that the film highlights the voyeuristic position of the audience, but rather that the audience is alternatively made to identify with the victim and with the aggressor, with the frightened and with the frightener. In that way the spectators too are made to look into the mirror at their radical other self, their monstrous self &#151 whether dead or murderous. Peeping Tom may be concerned with the self-reflexive voyeurism of cinema and it may be explained in Freudian terms, but beyond that, it touches on something essential and universal: pure terror. It shows us the Gorgon, looking unflinchingly at what scares us most, making us experience that terror, and it is what makes the film resonate so deeply in all of us. (1) For the technical description of the various cameras that appear in the film I am indebted to William Johnson, ‘Peeping Tom: A Second Look’, Film Quarterly vol. 33, no. 3 (Spring 1980), p. 3. (2) Jean-Pierre Vernant, La mort dans les yeux: Figure de l’Autre dans la Grèce ancienne (Paris: Hachette Littératures, 1998), p. 12. My translation. (3) Thalia Feldman, ‘Gorgo and the Origins of Fear’, Arion vol. IV, no. 3 (Autumn 1965), p. 490.